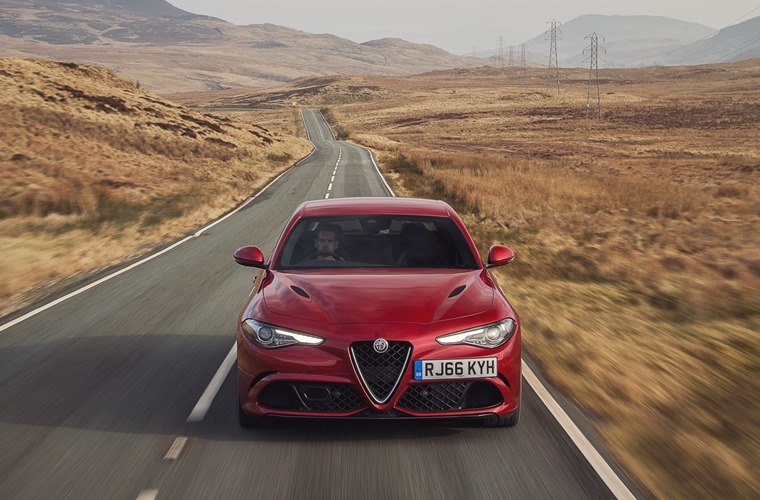 Featuring sleek style, an elegant interior and exciting driving dynamics, the Alfa Romeo Giulia Quadrifoglio is the car you've been waiting all your life for. It will steal your heart. It’s been two days and I can’t stop thinking about you. I know our time together was relatively brief, but you made such an impression on me that I’m hoping we’ll see each other again sooner rather than later. Having to get back into a pick-up truck afterward just made it all the more obvious what I’m missing in life. From the moment I laid my eyes on you I knew you were special. Every surface on you looks hand-sculpted by a maestro, an unrivalled heritage going back through the decades, perfectly punctuated by the cloverleaf you wear with pride as a sign of your uniqueness. 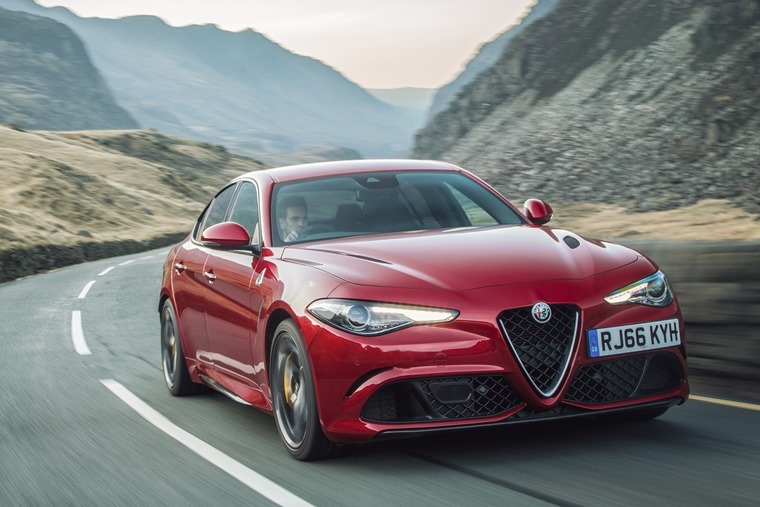 The aluminium wings and doors along with your carbon-fibre bonnet and roof ensure you are at your optimum weight for performance, and with a proactive double-wishbone suspension and rear-wheel drive I know you’ll take care of my racy needs. Taught and compact, your curves are perfectly proportioned too, all with performance and aerodynamics as your number one concern. And talk about performance. 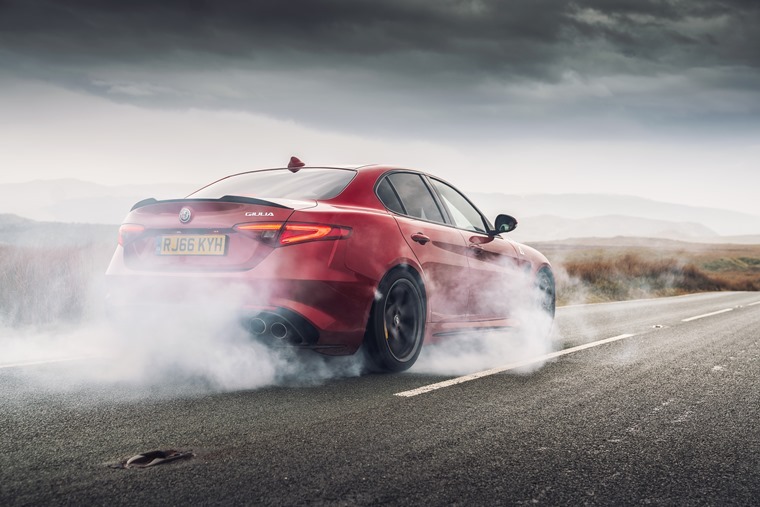 By having a 2.9-litre twin-turbocharged V6 engine under your bonnet you can produce 503bhp and spin to 7000rpm, all transferred directly to the rear wheels via an eight-speed automatic gearbox and a carbon fibre driveshaft. You can make even the most jaded automotive journalist’s heart leap and feel like a giddy schoolboy. Being able to go from 0- 62mph in just 3.9 seconds and all the way up to 191mph not only makes you the fastest-accelerating car and peerless in your class, but the way you build up the speed ensures I feel in control at all times. And yes, yes I do. But first I need to choose what amount of fun I want. This comes in the form of a dial drive mode selector, offering Dynamic, Natural, Advanced Efficiency and Race modes to choose from with each option offering something for every driving style. 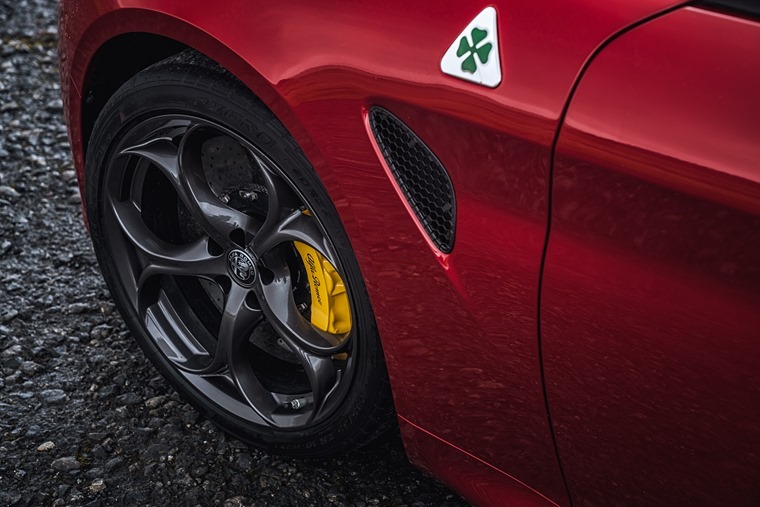 Opting for Race mode completely deactivates the car’s electronic aids on top of preparing the engine, transmission, steering, brakes and rear differential for some serious racing. Sadly, Giulia, I’m not man enough for that, and your DNA mode more than suffices. Please don’t judge me. When it comes to handling, you change according to your mood. In Natural mode your steering feels light in the hands, in Dynamic you give a little more weight and allow me to idle in gear a little longer as well as limiting the amount of oversteer when I get ahead of myself. Advanced Efficiency means you’ll go a little longer and act much more economical when it comes to your 34.4 mpg and 109 g/km emissions. 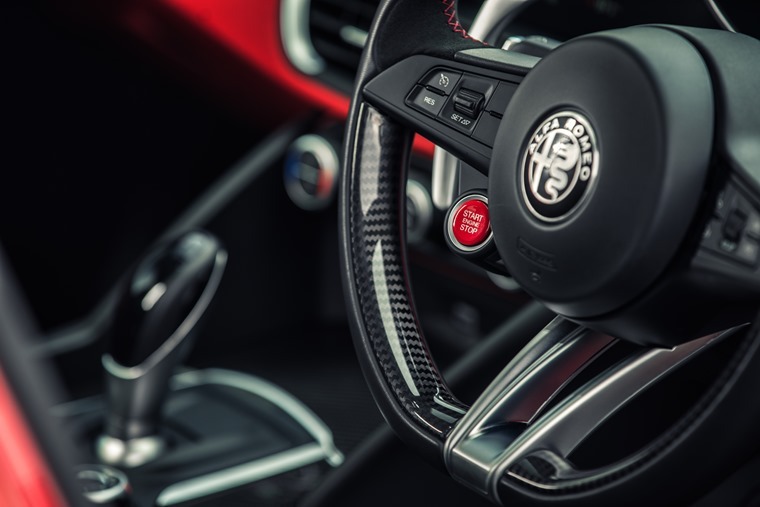 The controls are simple, grouped together on the three-spoke steering wheel, and the seven-inch infotainment displays all the essential information about the car, changing according to which DNA mode is selected and offering a variety of readings such as lateral acceleration and fuel consumption. All of this is done in premium comfort which is centred around the driving experience. 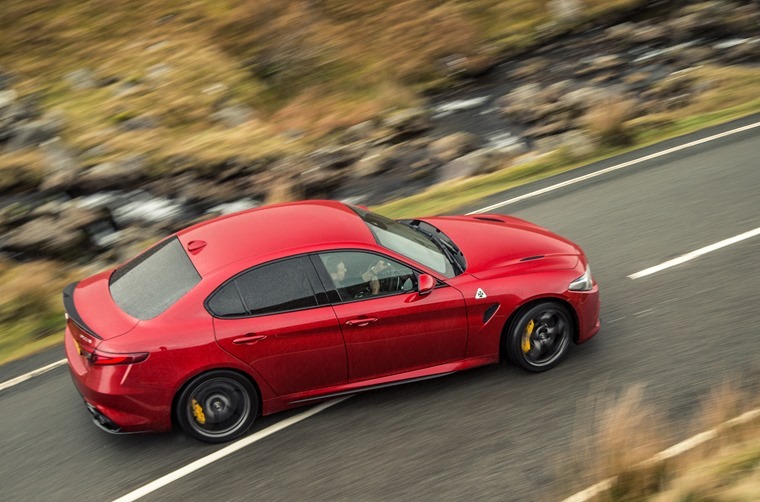 Giulia, your interior is as elegant as every other aspect of you. The low and leather electric-adjustable seats are comfortable and there’s plenty of room for both driver and passenger. And the little touches make me love you more, with white and green stitching on the dash signifying your special cloverleaf badge. What’s more, you keep me safe Giulia. Having been awarded a five-star Euro NCAP rating, and given a score of 98% for the adult occupant protection, you have the highest score ever achieved by any car. This is no doubt thanks to your Forward Collision Warning, Autonomous Emergency Brake with pedestrian protection, and Lane Departure Warning. La meccanica delle emozioni is the tagline you use to draw drivers to you, and that means the mechanics of emotions. Giulia, you have my heart.